For Zünd, there were several highlights at FESPA 2018 which included the LM 100W Cut & Seal Laser Module, the dual-beam D3 cutter and the L routing system. The LM 100W Laser Module displayed its effectiveness in simultaneously cutting and sealing polyester fabrics. High productivity and high-level material handling automation were showcased with the dual-beam D3 cutter. 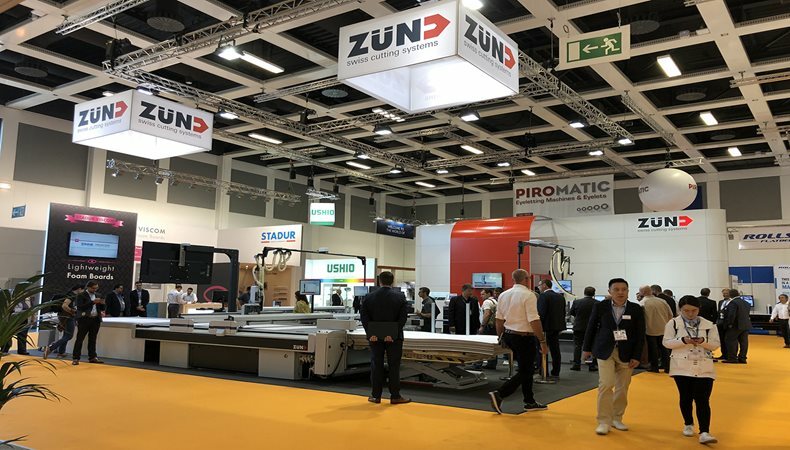 On the G3, Zünd exhibited the RM-L system’s high performance and fully automated routing capabilities whilst processing wood and acrylics. This demonstrated the numerous opportunities that the powerful 3.6kW spindle offers for routing rigid materials. At Zünd’s stand, visitors experienced the company’s latest product, the Over Cutter Camera OCC. In a single shot, the OCC captures all registration marks visible in the cutting area. The cut center immediately compensates for any material distortions and begins the cutting process. This workflow is useful for cutting textiles where single-image capture technology results in huge time savings. The benefits of the OCC system were acknowledged by the jury for the EDP Awards 2018 and the European Digital Press Association gave the Over Cutter Camera OCC the award for “Best Finishing Support Tool” in the “Finishing/Enhancement” category. Modular Zünd cutting systems are vital in a unified digital production workflow. This was proven by the fact that for finishing, exhibitors like HP, Kornit Digital, Canon and Dover Digital Printing all depended on Zünd cutting technology. At HP’s stand, a Zünd cutter was featured and was a perfect fit for finishing output from the company’s latex digital printing systems. At Dover and Kornit’s stands, visitors experienced live demonstrations of Zünd’s ability to precisely, reliably and effectively stretch fabrics for garment home furnishing applications. Zünd had an additional stand at the new Digital Corrugated Experience. The stand was featured in the demonstration and education area of the show and Zünd made new contacts. The benefits of digital production for packaging and retail displays in one-on-one discussion with industry representatives were also promoted.